Hey everyone it is Douglas, and this blog that I started in May 2011 and ended in December is coming back! I have a lot to tell about, including the new URL, name, and content. 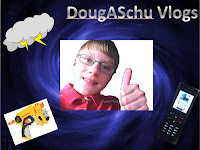 If you didn't know, I starting a vlog (video blog) series on Youtube (on my original channel) called DougASchu Vlogs. Since May, I've been making videos about Nerf, Tech, and Weather...my three main interest areas. In late June and early July, my videos became a weekday routine. They are a lot of fun, but also a LOT of work to make. It takes about four hours per vlog between researching, filming, editing, and uploading the day's video. That kind of schedule only works in early summer when I have quite a bit of free time. As 4-H, soccer, and Student Council, plus preparing for high school, become a full-time ordeal, I knew daily vlogging was no longer an option. My plan as of Wednesday was to film segments of the video every day, and then compile a three minute video for upload on Saturday. But, as I was looking through my Google Products yesterday, I saw Blogger and remembered What's That? Nerf from 2011. I decided to look at the pageview count and....I had over 3,250 pageviews! The last time I had looked at my stats for the blog, September 6th, I had 350 pageviews. To me, those numbers are crazy! Anyway, that convinced me that the return to blogging might be the way to go. Therefore, I've spend a little while revamping the look of the blog, plus changing the name to "DougASchu Blogs." This will be my main point of activity in the whole blogging/vlogging world. I will do the daily segment Saturday video, but for all the latest Nerf, Tech, and Weather news, this will be my base. I know that typing up a post is a lot quicker than making a video, and it will help my audience as well. I hope that I am just at the starting point and look forward on creating a unique, entertaining yet informative blog to supplement my weekly vlogs. Thank you for your support in the all new DougASchu Blogs!